Cobia (Rachycentron canadum) are distributed worldwide in tropical and warm-temperature waters. They occur along the Atlantic coast from Nova Scotia to Argentina, and are most abundant in U.S. waters from Chesapeake Bay south through the Gulf of Mexico. Male cobia typically reach sexual maturity by 2 years (generally 2 feet long), while females are sexually mature by 2-3 years (generally 3 feet long). Females grow to be larger than males, and may reach 6 feet and weigh up to 100 pounds. An extended spawning season occurs from late June to mid-August along the Southeastern U.S. and from late summer to early fall in the Gulf. 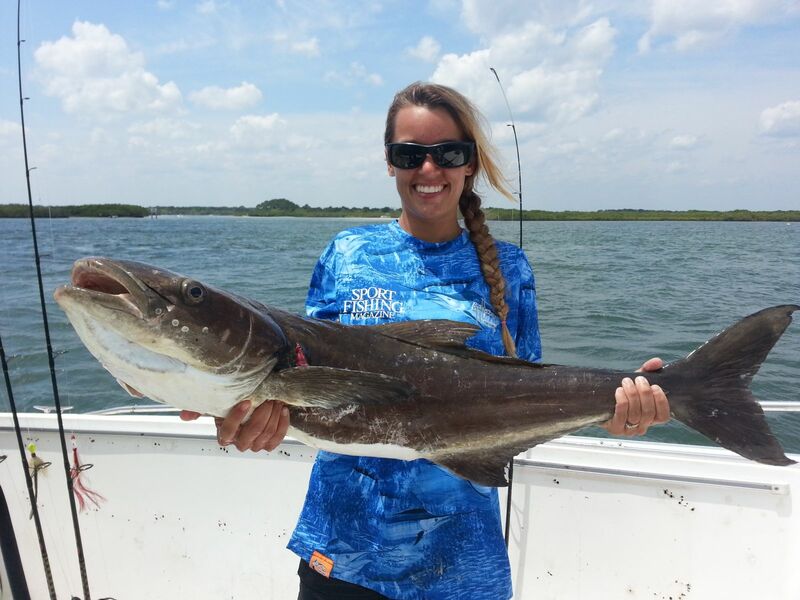 Cobia are broadcast spawners; a single female may spawn many times each season. Cobia make seasonal migrations, wintering in the south and moving north for the summer months. They are drawn to structure to feed and find shelter from predation. Juveniles and adults are often found around live bottom, wrecks, and buoys, as well as flotsam and seaweed mats. Their diet consists primarily of fish and crustaceans. Enthusiastically pursued by recreational anglers, cobia support recreational fisheries throughout the South Atlantic and into the Mid-Atlantic region. Primary methods include bottom fishing with natural bait as well as sight-casting, which has gained popularity in recent years. The annual recreational harvest of AMG cobia, found along the US Atlantic coast from New York to Georgia, has varied erratically with little trend since 2005, ranging from 328,000 to 1.7 million pounds. In 2017, recreational anglers landed approximately 805,431 pounds of cobia. The commercial fishery is on a much smaller scale, with the fishery landing 145,562 pounds in 2017. Primarily a bycatch fishery, it has been associated with the snapper/grouper hook and line fishery and troll fisheries for many South Atlantic species, although more directed fisheries have recently developed in some areas. Commercial restrictions are consistent throughout the range, with a two fish per person possession limit, 6 fish vessel limit, and a 33” fork length minimum size limit. Two cobia stocks are recognized off the US Atlantic coast; the Atlantic Migratory Group (AMG cobia) and the Gulf of Mexico Migratory Group (Gulf cobia), occurring throughout the Gulf of Mexico and extending to Florida’s east coast. The SAFMC manages the Atlantic stock, and is allotted a small portion of the Gulf stock’s allowable catch limit (ACL) to manage the Gulf cobia which extend along the Atlantic coast of Florida. Genetic studies continue to explore appropriate stock boundaries, and a 2018 SEDAR Stock Identification Workshop is using the most recent data available to evaluate stock structure for future assessments. The 2013 SEDAR stock assessment indicated overfishing was not occurring and neither stock was overfished. ACLs were established as a precautionary measure to prevent the stocks from reaching an overfished status. 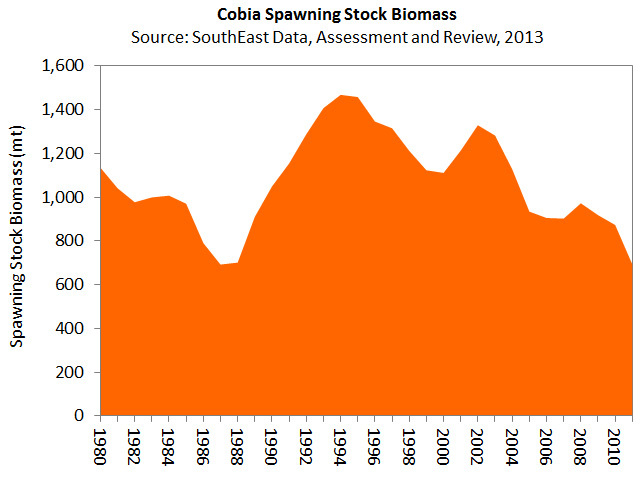 Despite the stock status, the last assessment showed a general decline in spawning stock biomass since 2002. Since the assessment, recreational harvests have continued to be highly variable and exceeded the ACL (620,000 pounds) in 2015 and 2016. Future overages could lead to the stock becoming overfished. The stock status is expected to be updated by the upcoming SEDAR stock assessment in 2019. In 2017, the Commission approved the Interstate FMP for AMG Cobia. Complementing many aspects of the SAFMC’s cobia regulations for federal waters extending from Georgia through New York, the FMP was initiated in response to recent overages of the federal ACL for AMG cobia. 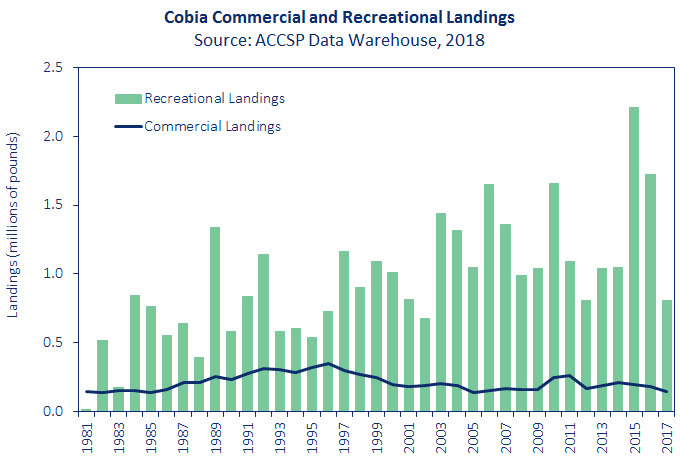 Managing the recreational ACL on a coastwide basis has resulted in federal closures and significant overages in 2015 and 2016, disrupting fishing opportunities and jeopardizing the health of the stock. Recreational harvest of state-specific allocations will be evaluated over a three-year time period. If states exceed their soft harvest targets, states will be required to adjust management measures to achieve the soft harvest target in the subsequent three-year period. The FMP provides the opportunity for states to declare de minimis status for their recreational fishery if landings constitute less than 1% of the recreational AMG cobia harvest. In 2018, the SAFMC and Gulf of Mexico Fishery Management Council approved Amendment 31 to the FMP for Coastal Migratory Pelagic Resources in the Gulf of Mexico and Atlantic Region (CMP FMP), which would remove Atlantic cobia from the CMP FMP and make the Commission the sole management authority for this stock. In February 2019, Amendment 31 was approved by the Secretary of Commerce, with the transfer of management authority to the Commission to occur in March. In anticipation of approval of Amendment 31 to the CMP FMP, the Board initiated development of Amendment 1 to the Interstate FMP in 2018. This amendment would reflect the Commission’s sole management authority by updating complementary portions of the Interstate FMP, which are dependent upon the CMP FMP, to be free-standing regulations. Additionally, Amendment 1 would establish the protocol for the Board to recommend federal waters management measures to be implemented by NOAA Fisheries. The Board will continue the development of the Amendment into 2019, with final action anticipated in late summer/early fall.